Unfortunately, due to other travel plans, I was only able to spend a little more than one day in Kauai. When we landed in Kauai early in the morning, we hit the ground running, trying to experience as much as possible before having to catch our flight to the big island the next afternoon. So, how did we spend our one day in Kauai? Mark Twain called the Waimea Canyon the “The Grand Canyon of the Pacific,” and rightly so! At ten miles long, a mile wide, and 3,600 feet deep, Waimea Canyon is the largest canyon in the Pacific. 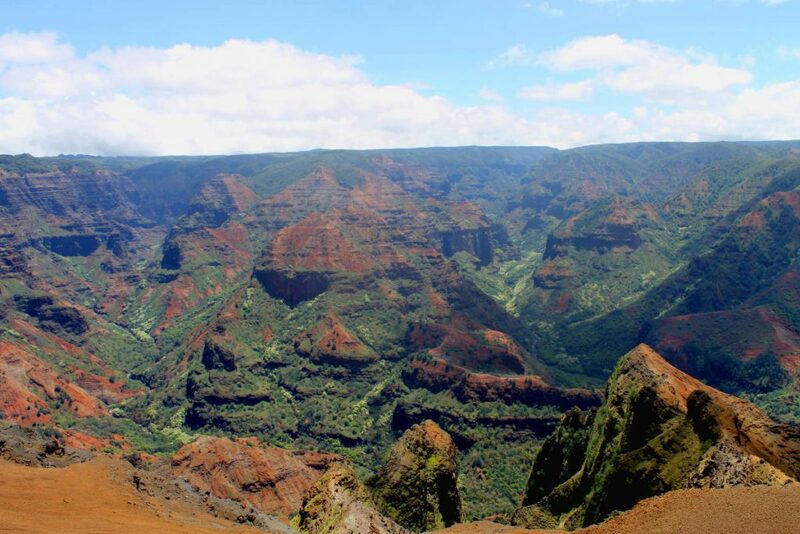 Stop by the Waimea Canyon Lookout to get fantastic view of this beautiful landscape! This was probably one of my favorite activities, not just in Kauai, but in all of Hawaii. 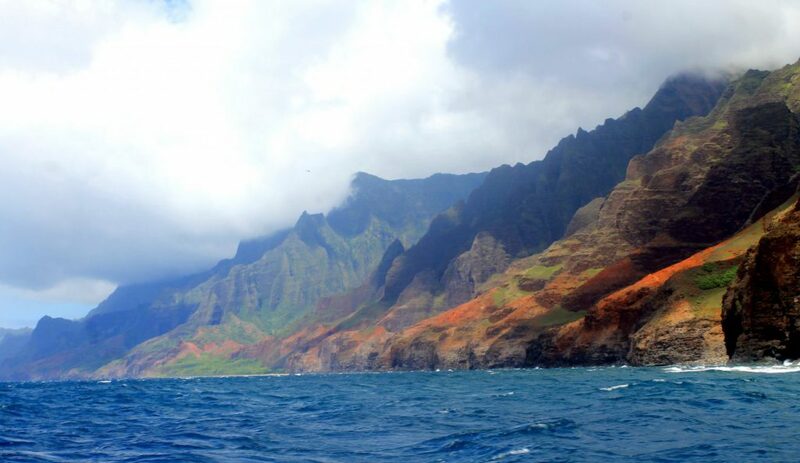 With the Na Pali Exerience tour group, you can explore the absolutely stunning Na Pali coastline, and even explore some of the sea caves. Plus, you can go snorkeling and maybe even see some sea turtles or dolphins! The Kilauea Lighthouse is located within the Kilauea Point National Wildlife Refuge. 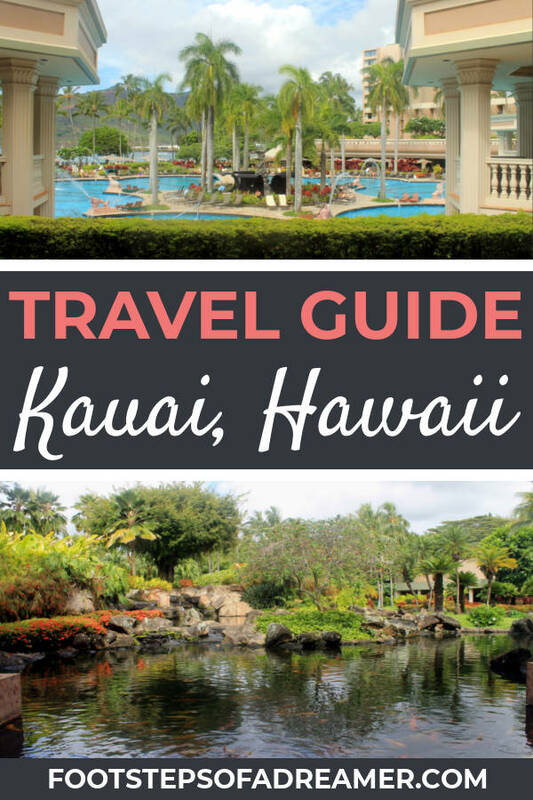 It’s on the opposite side of the island from the Waimea Canyon and Na Pali Coast, and about a 40 minute drive from the airport. 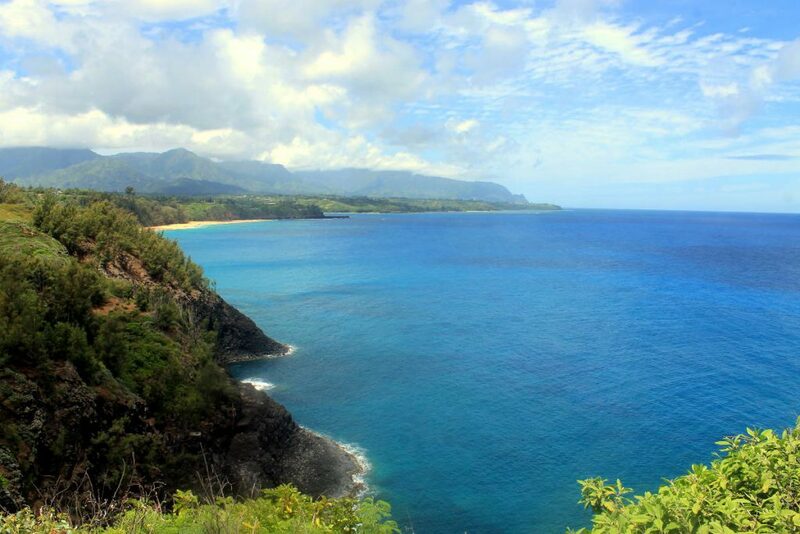 For that reason, I’d only add this to your Kauai itinerary if you have some time before your flight. If you are able to squeeze it in, you’ll find all sorts of endangered and native Hawaiian seabirds in their natural habitat. 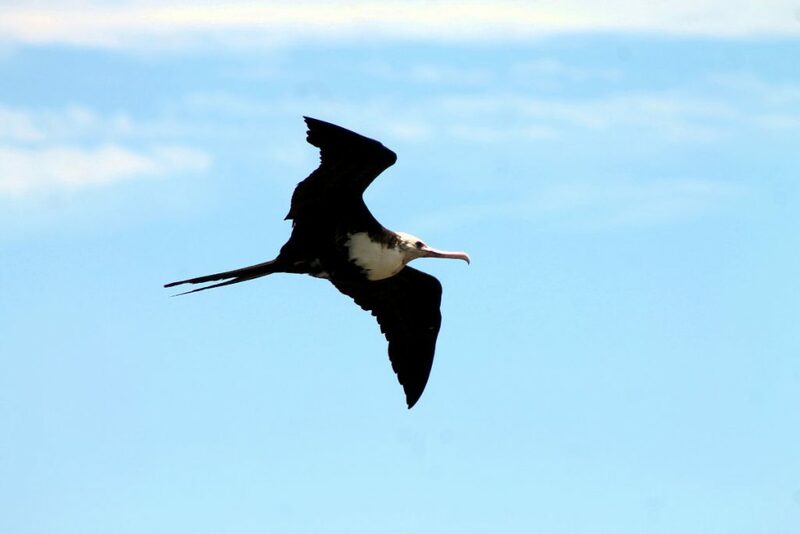 If you love bird watching, this is definitely a place you’ll want to stop. I’ll admit that when I first started doing research and planning for our Hawaii trip, Kauai didn’t seem all that interesting to me. It’s not as commercialized as some of the other places in Hawaii (such as Honolulu). However, after arriving in Kauai, I quickly realized how wrong I had been. As I mentioned above, Kauai isn’t as commercialized, meaning it has little to no public transportation. The best way to get around Kauai will be to rent a car. Thankfully you can get a car rental at the Kauai Airport (Lihue) right when you land. There are several places to rent a car, but we chose Alamo because we were able to get it for relatively cheap as part of our Kauai travel package. When it comes to hotels, I’m usually more of a budget traveler, preferring more 2 or 3 star hotels. However, I was in Hawaii through my mom’s company, so we had a little bigger budget than we normally travel with. 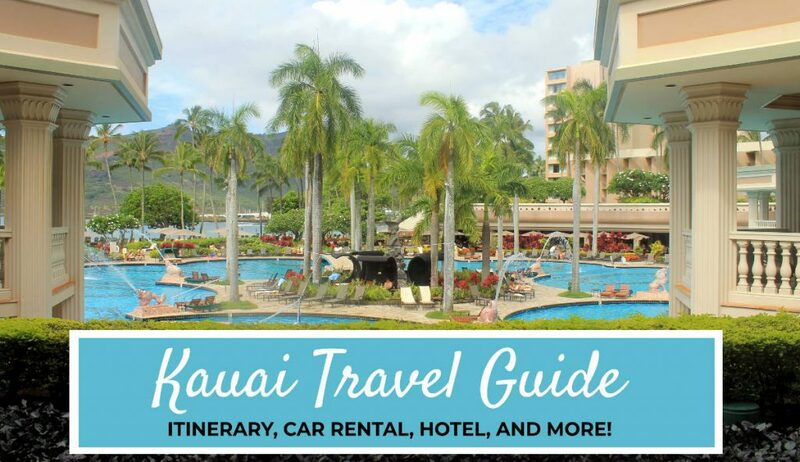 For that reason, we chose to stay at the 4-star Kauai Marriott Resort (it’s rated a 4-star hotel by TripAdvisor, but definitely feels like a 5-star). The hotel is absolutely incredible. 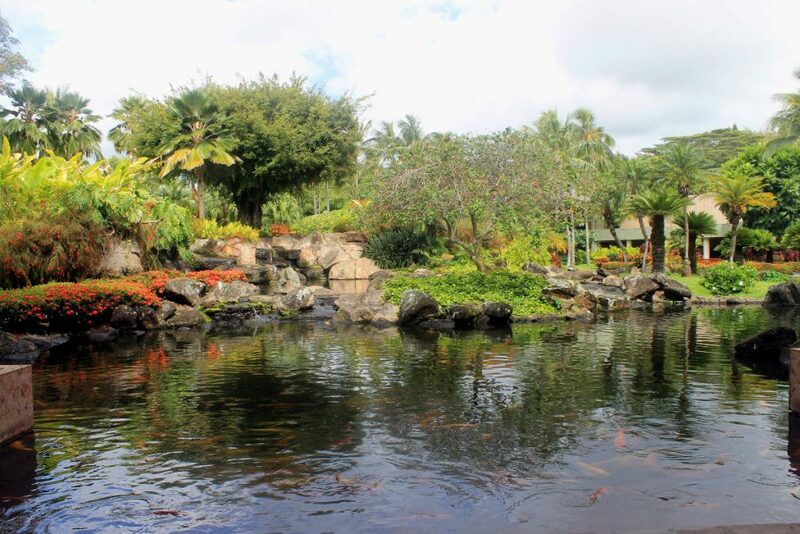 While my mom checked in at the counter, I walked over to the other side of the lobby to appreciate the large pond full of lots of plants and koi fish. From the check in counter, we made our way to our room, passing by the fanciest outdoor pool I’d ever seen and several smaller gardens. The place was so big we actually got lost trying to make our way to one of the hotel restaurants for dinner. Would I stay here again? If I had the money, I would most definitely stay here again. It’s what I imagine when picturing the cliché “Hawaii paradise.” However, I’m just not typically the kind of person to spend a lot of money on hotels. I’m one of those whirlwind travelers where I leave my hotel in the early morning and don’t return until late in the evening, meaning I don’t need anything fancy. If you are looking just for a place to sleep, it’s definitely more than you would need. 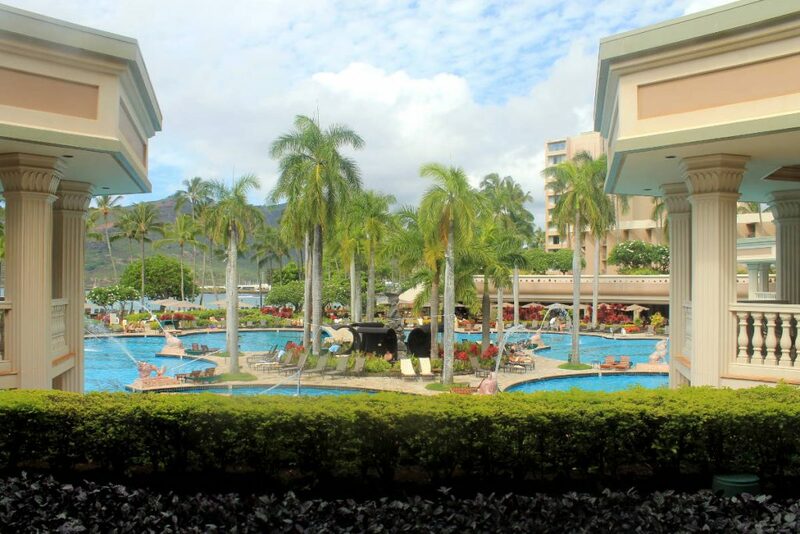 However, if you’re looking to just kick back and relax during your time in Kauai, Hawaii, Kauai Marriott Resort is definitely a fantastic place to stay!